Justyna Badach will present her project Land of Epic Battles, a new series of images made using film stills from ISIS training videos. 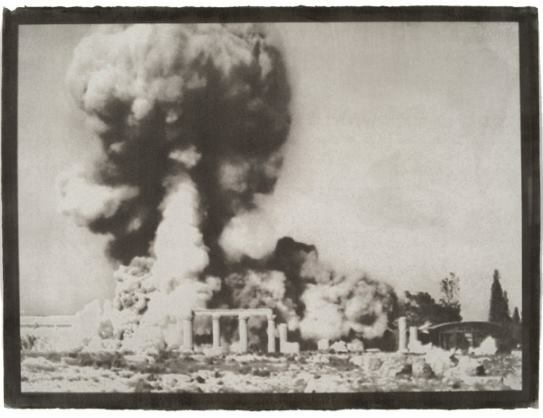 After a year of experimentation, Badach discovered a 19th-century process that allowed her to use gunpowder as a pigment to create large, dichromate prints that resemble antiquated documentation of Middle Eastern sites and landscapes. Justyna Badach's work has been exhibited internationally including, The James A. Michener Art Museum, Fotografia Festival di Roma, The Griffin Museum, Catherine Edelman Gallery, among others. Her book, Bachelor Portraits is in the artist book collections at Rice University, Temple University, and Haverford College. Badach has been awarded an artist residency from Light Work, and grants from the Pennsylvania Council on the Arts, Leeway Foundation, and The Independence Foundation. Oh, Snap! is a program created by in response to the interest among local women to come together, share stories and learn about photography in a safe, non-judgmental space. Self-identifying women from the neighborhood and the larger community are welcomed to attend. You don’t have to sign up. You don’t have to pay. You come when you can. PPAC welcomes you to Oh Snap! where we make friends and photographs. Oh, Snap! meets on the third Saturday of each month, from 10:30 am – 12:30 pm.